The little ferry to the large island in Lake Victoria. This has been an amazing trip. Though we leave for home on Thursday at the end of six weeks, our adventures and vision continue to get better each day we are here. Yesterday Gail and I traveled by ferry to the islands with a local pastor who oversees the islands that are out in Lake Victoria. We ferried out to the big island several kilometers off Jinja out in the lake. I’m not yet sure why this was important to me, but I have felt a need from the Spirit to go to the islands even before this trip began, so when the invitation came, I took it. We left Jinja in the dark of early morning to catch the early ferry, and returned in the dark around 7:30 pm last night. We spent all day on the island visiting churches that he oversees. Typical transport to the islands without a ferry, which is most of them. , he asked, “Do you have Bibles? I need a Bible.” She would have given him hers, but had left it back in our room. This seems to summarize for us the isolation of these people, 250,000 islanders scattered through 52 islands, mostly accessible only by motorboat, few having even the small ferry service we used to get to this larger island. We were escorted through each village by the children who were out in force because there are few schools. ed with a young woman who has an entrepreneurial farm with chickens, pigs, and mushrooms, as well as other crops. We were there to investigate the mushroom-growing process as a potential way pastors can generate income for their families and be self-supporting. This young woman was a Christian girl who went to a special class at a university to learn about mushroom growing. She spoke eloquently about her process and her product, showed us everything we asked, and answered many questions. This girl is the poster child for entrepreneurial enterprise. I was very impressed and paid her a consulting free when we left. We now have a small group of pastors who are praying about an experimental mushroom program to see how viable this crop would be for them to grow and market. The vehicle we now share with three other Ugandan ministries. PTL! o the large gate of the royal Busoga palace compound that sits overlooking Bugembe. The Busoga are the traditional local tribe from this region and have a royal family named Kyabazinga. You can see this large building from almost anywhere in the area because it is a large pyramid-shaped structure outlined against the horizon at the crest of the ridge. I thought we had gone as far as we could on the road, and we were turning around to find an elevated spot to take pictures of the panoramic lake view when Samuel began an offhand conversation with a man who was walking down toward the gate. Before I knew what was happening, we had been invited inside the compound to look at the house and were offered a chance to tour the newly finished but as yet unoccupied Kyabazinga mansion. So we received a personal guided tour of the 90 room palace of King Kyabazinga’s family. It sits unoccupied because the family has been unable, since the king’s death some years back, to settle the family succession issue (apparently two heirs are battling it out). I don’t think ever happens! We were just in the right place and the right moment. My Ugandan friends are even having a hard time believing the story when I tell them. “You did what?” they ask incredulously. We concluded the day in the home of an overseer of a number of church plants in a nearby district while he and his wife hosted us for dinner to thank us for our church-planting work. A huge Ugandan feast was laid out for us and we ate till we could hardly walk. So altogether, this last two days has been amazing. Attached is a photo or two of the car we now share with three other ministries in Uganda. It is a Toyota Noah. I believe it will be a huge savings and resource for the advancement of our various mission operations in Uganda. Yes, we took it on the ferry to the island and drove it all over. As I’ve traveled now hither and yon throughout this area of Uganda, it is surprising to me how I hear the Spirit of God saying things to me. I wonder if I’m as sensitive in the U.S. as I seem to be here. I wonder if I hear the same promptings, but for some reason am not as responsive as I seem to be here. Maybe it has to do with the reason I’m here, that I’m prepared to be sensitive, but this is a troubling thought because it suggests that I perhaps am not prepared to hear God as I go about my routines in the U.S.
An example of what I am speaking about was brought to my attention today as I taught church planting principles in a place called Massesse (Ma-sess- say). The group was larger than I normally have from an individual church, about forty in number. I emphasize that I only need to see the church planters in the church, and so I typically have seven to fifteen people at most in this kind of group. But today I had about forty men and women, all interested in going out to the villages to plant churches. Of the many churches in which I have taught over the last five weeks, most were scheduled by my “team,” Pastor Samuel Wasula and Pastor David Waisana. These men take the cal ls from pastors that result from my pastor conferences where I give a general introduction to my church planting methods. They collect the calls and arrange the schedule to follow up these direct requests for training in the churches by the pastors. Or rather, they have done this in every case but two. In the first case, I felt strongly prompted last March, when we drove out along the river for many miles, that there were churches out in these isolated villages who never receive outside ministry, and so I followed that prompting of the Spirit by telling my team to make sure and schedule churches out in this specific area. Just yesterday, I taught another pastor conference for about twenty pastors out in that area. It is the third general conference I have led out there, all in an attempt to reach these isolated areas. By this method I have reached at least seventy different pastors with the teaching that they can easily plant a church in the next village beyond their church. Now my team is following up with them to see if they are applying what I have taught and actually going to the villages. I know some of them are following through because I have returned to two of these churches and taught their church planters how to go, and I have personally gone to the villages with them that they are targeting in order to jumpstart them. All this activity because I simply followed the prompting of the Holy Spirit to go to this area with my message. The decision to go Massesse resulted from the same kind of circumstances. Every day as we drove down the main road on our way to some isolated location, I noticed an area to the south along the edge of the lake far in the distance. I felt my heart leap toward this area repeatedly during these trips back and forth. I asked my team what that area was and they told me it was called Massesse. Every day after that, I heard the Lord say, “Don’t forget to go to Massesse.” So I insisted that Samuel and David include Massesse in our plans. So that is how they happened to call the pastor who attended our conference in Jinja a month ago and schedule the meeting. So here we are, virtually at the end of the trip, since Gail and I return home next Thursday (one week), accomplishing our last training in a church today (Thursday) and tomorrow at Massesse. This is the direct result of the Lord’s prompting, and we would not have scheduled this location if He had not prompted it. So when we arrive at a place under those conditions, I am always very interested to find out what about this place has so attracted the Lord’s attention. Massesse is a lakeside community – it sits right on the north shore of Lake Victoria on the east side of Jinja. The view from where the church building sits, just a little way up the hill from the road, gives a wonderful panoramic view of the lake. The pieces began to fall into place for me when the pastor told his vision for church planting. There are 52 islands in the lake in this region that are settled by a considerable but very isolated population. He has been praying for years that God would enable him to plant 1000 churches out on these islands to minister to all these people. He told me there are now 300 churches out there among the island people, many of which he has planted, but he has been praying for someone to come and show him how to do it in a more efficient and effective manner. He is convinced that our arrival here is the direct and specific answer to his prayers. All through the teaching today, I noticed him suddenly noting something in his notebook as he listened, and later he told me I had already answered many of the questions he has been asking about church planting. The funny thing is that before I ever left Texas to come on this trip, I noted the presence of a population on these many islands in Lake Victoria, and I asked the question in my mind about how I could possibly reach this extremely isolated people group with church planting. To make a long story short, Gail and I will visit several of the islands on Monday or Tuesday next week with the pastor –his invitation. I am already beginning plans for an island hopping church planting mission next time I come to Uganda. So this resulted from listening to the prompting of the Lord as we drove back and forth along the main road several miles north of the lake and this community. I am left with another thought as well. When I return to the U.S., I’m going to listen more closely for His gentle prompting voice. I am purposing in my heart to be less distracted by the various competing voices of our American culture. I’m curious to see how that works out. Everywhere I go in Uganda, I notice the animals. They coexist with the people in almost all environments. I see chickens pecking out their breakfasts even in among the shops in the city suburbs, where you would not expect to see chickens on the busy streets. I see goats and sheep, cattle, and a few pigs. I even saw rabbits yesterday grazing happily in some tall grass under the watchful eye of a teenage boy. In a long, hard rainstorm today, I watched a small black goat, which had been left out, balancing atop the rock to which he was tied in order to stay above the pooling water and calmly chewing his cud. But of all these creatures great and small, I pity the ducks the most. It seems to me that Ugandan ducks are not living typically ducky lives. I have seen many Ugandan ducks of all varieties, but I have never seen one in or near any source of water. These poor birds are “dirt ducks.” They seem to live and die like the chickens all around them, sadly pecking out their existence in the same red Ugandan dust, but waddling clumsily after fallen tidbits instead of darting and scratching for seeds and bugs like the more agile hens, chicks and roosters on every side. They are literally ducks out of water, and I am sad every time I see one. We were returning from a rainy day of church-plant training out in the villages along the very bumpy and muddy Kamili Road, the one we have affectionately dubbed the Wages of Sin Road for the punishment we take as we ride over it. As we passed through a small village, I witnessed a truly pathetic sight – a duck had waddled out into the road and stood transfixed in front of one of the rain-filled pot-holes that had temporarily become a miniscule pond on the side of the narrow dirt track. We drove up to him and around him, and he didn’t seem to notice us as we passed. He just stared at the tiny little pond, almost wistfully, I thought. I imagined the mental process running through his primitive duck brain as he stared at perhaps the largest body of water he’d ever seen all in one place at one time – “I know this thing; I think I’m supposed to do something, but what is it? Should I launch myself into it? Should I walk in it? Should I eat it? What am I supposed to do? Something about this thing is important, but what is it?” We left this heart-breakingly indecisive little duck behind us as we continued on our way, but I couldn’t get him out of my mind. His condition seemed so hopeless. Ducks are water birds, you see. They are created to be water birds. Living without water to swim in, unable to dive down to feed off the plants and small fish living at the bottom of lakes and rivers, barely eking out their meager “duck-ity” while standing in dry, red dust up to the tops of their webbed feet, competing with their much faster and better-adapted chicken brethren for every scrap of food – this is no life for a duck. It seems tragic to me. You are surely asking about now why I am going on so much about mere poultry. Surely you’re wondering whether my gears are all meshing properly. I think I’m okay. I’ve asked the same question as I realized how riveted my attention has been on these poor, deprived animals. I pondered this and came to an unpleasant and startling realization, a sobering discovery of how my brain is functioning as I go to and fro in this beautiful land. I am daily looking at difficult things, humans who suffer under poverty and unemployment that breaks the spirit, untreated medical conditions that leave permanent scars, shortening or devaluing lives that were created to live in the image of God. I see joyful orphans. I see a consuming poverty that eats at the souls of a beautiful, sweet, and able people. These things I can see. But I talk about the ducks. The ducks without water. I know what I’m doing when I do it, and I also don’t know, but I only don’t know because I don’t want to know. There’s a lot here I don’t want to acknowledge. So I tell you about the poor ducks instead. As you read this, Gail is aboard an Emirates Airline aircraft on her way to Dubai. She will spend a night in Dubai, and then fly out Saturday morning for Entebbe where I will meet her and take her back with me to Jinja here in Uganda. We have been graciously invited to stay in the home of a local pastor for the two weeks remaining of my six week trip. We expect this to be a great cultural experience as well as a great help to our budget. 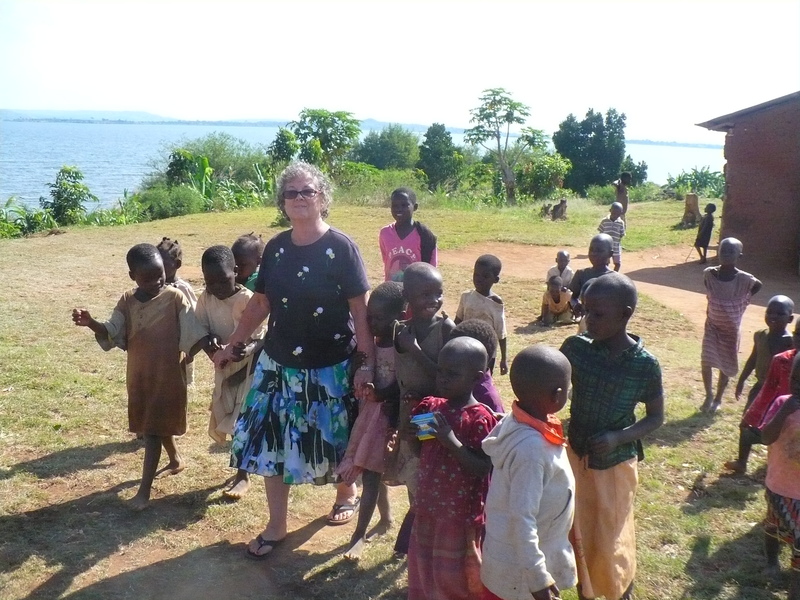 This will be Gail’s first trip to Uganda and she is excited. I am excited to show it to her. Hopefully, at the same time as we are picking her up in Entebbe, we will be closing on the purchase of a vehicle in Kampala. This vehicle will be shared by four different mission organizations in Uganda and will save hundreds of dollars of mission funds for each of us in our diverse callings. I am church planting, another is providing clean water and hygiene, another computer services in remote non-profits. The fourth is a Ugandan mission organization that trains Ugandans to become self-supporting through entrepreneurial enterprise. So this vehicle will serve a many-faceted ministry in Uganda and save much money that would otherwise be spent on rented vehicles. So Saturday looks to be a very busy day. Please pray with us that all will go smoothly with Gail’s travel and with the vehicle purchase, and that these two events will synchronize well so that we are not stuck for hours in Kampala filling out paperwork. This venture has taken much planning and coordination and now it is finally coming to fruition. There is a lot going on here in Uganda with my work, and I am busy five days a week teaching in the villages and preaching in a different church each Sunday. I have not written as much lately because I have been so tired getting in at night that I go to bed early, then get up the next morning and do it again. The work is amazingly great. I now have contacts that could extend the church planting training that we are doing into Kenya, Rwanda and Nigeria. Understand, I am not seeking that advance beyond Uganda, but these contacts are seeking me out. I continue to stand amazed to see His hand at work! I’m doing my best just to keep up with Him. God’s sense of humor and His skillful way of herding us along like an unruly cluster of cats never fails to catch me by surprise. I think this is a good thing – I never know what to expect. Today we arrived at the Village of Buwera at 9:00. As often happens, by 10:45 we had only five people of an expected 30-50. I didn’t want to start teaching because I would just have to repeat myself when the main group arrived, so I was pondering what to do. Finally, the Holy Spirit suggested that we take the five on a field trip to the village they had targeted for a church plant, Bupadengo Nakabale, and begin the process with a prayer walk through the village. I prefer hands-on practicums to classrooms, anyway, when I can get them. Some background: we teach the son of peace/oikos method of church planting. That means we send teams into the village to pray and find a person who will welcome them, and either receive Christ through evangelism or, if already a Christian, be open and supportive of the idea of a church in that village. We then evangelize the oikos or household of this “person of peace,” which includes their family, relatives, friends and neighbors. From that group of responders, we move toward planting a New Testament Church through short and long term discipleship among the members of the household. The pattern is from Acts 17:26-28, and Luke 10:1-11. This principle of oikos (Greek word used in the Bible) refers to the extended family, clan, immediate tribe, etc. of the person of peace. This household or clan provides the best entrance into a new area that has no church. So at 11:00 we loaded our group of five into our vehicle and told the pastor we would be back in an hour, knowing that other folks would drift in by then for the training. We drove about three miles down the main road and finally turned off on a narrow dirt track and headed into the bush. After a quarter mile or so we began to encounter homes scattered along this track, which gradually turned into a village clustered around a water pump as we continued deeper into the area. I thought that was interesting and filed it for later discussion back at the church. Then we pulled up at this man’s home, climbed out and I did some quick training, broke them into teams and sent them out to pray. As we began to walk, this same man, gesturing to the houses grouped around us, said, “This is my clan. Every one is a relative.” And then he introduced me to his brother, who came over to greet us from a nearby yard. Sometimes it takes a long time for me to get it, but this man, who hadn’t had the scheduled training yet, and didn’t know anything about persons of peace or oikos/clans, had just used the exact language when describing his village that I would teach in my church planting class an hour later. I was starting to think God might be moving ahead of us here. We walked and prayed, were invited in to pray for one sick lady – yes, a relative of this man and member of his oikos – then, the hour being late, climbed back into the car, and headed back to the church. As we passed down the road we turned the car around at a beautiful little circle of houses with a clearing that would make an excellent place for a church to meet. I looked significantly at Samuel and said, “Do you see this place, Samuel.” He nodded and answered, almost laughing, “Yes, I do. I see this place, a good place for a church.” As we drove back toward the road, picking up prayer walkers as we went, we passed a group of people standing on the side of the road, all smiling and waving at us. As we went by, it felt to me like we were passing through a veil of some kind, and I was covered with chill bumps, and tears began to well in my eyes – can you physically pass through the Spirit of God or the glory of God? It sure felt like it. Here’s my conclusion about this event: the church up on the main road who had asked us to come teach their people about church planting because they want to plant a church is already half-way through their first church plant, and they don’t even know it. I am confident that they could offer an outdoor service on this very Sunday, and many people from this village, especially from this son of peace’s oikos would already respond. Is it really this easy? I think I passed a milestone today as a missionary – I was blooded on the Kamili Road. Truth be told, we hit such a bump, as compared with all the other bumps, that it drove my head into the car ceiling, even though I was tightly strapped into the seat belt and holding on for dear life. Split the top of my bald pate a bit and left a more-ugly-than-serious abrasion right smack in the middle of the vast expanse of my pink, sun-burned scalp. But I think that makes me officially a missionary, being blooded and all, so I’m wearing my scars proudly! What, you ask, is the Kamili Road? It is a road out of Jinja to the Northeast that is partially under construction, for the last four years, I am told, with no end in sight – not much progress either, I might add. The construction has added little improvement to the journey, merely creating tight one-lane junctures with large piles of upturned earth where traffic tends to bottle-neck. I guess every church not in Jinja proper is either on the Kamili Road or just off it on some even worse spur. I come to this conclusion from the amount of time we are spending on it, traveling from one church to another; If there are other roads in Uganda where churches exist, we’re not finding them. I will forever remember this road not for the blooding incident, but for another unfortunate occurrence. We were returning from the church, wending our way between pedestrians, bicycles without lights or reflectors, cars, trucks, taxis and buses, not to mention potholes, detours, 3 foot high half-constructed lane shifts due to unfinished grading, etc., etc. I was leaning out the window, trying to get a decent cell phone signal as I was talking to a friend in Jinja. I was not having much luck because every time we would begin, he would start a sentence, then our signal would disappear. We were on our fourth connection attempt. Suddenly, directly at the edge of the road in front of the car, an eight inch turtle lunged up onto the road surface from the grass shoulder and started crossing rapidly right in front of us. I was watching this drama unfold five feet in front of me, utterly horrified, when I heard the crunch, crunch of the front and rear passenger side tires passing over him, instantly transforming him into part of the muddy surface of the road. I will not get that crunching sound out of my head for the next two weeks, if ever! This event took about 1.5 seconds from beginning to end. One second, he was there thrusting himself forward with real gusto for a turtle, the next, crunch, crunch. The last thing my cell phone friend heard from me on the line before it disconnected for the final time was my anguished cry, “Look out! Turtle on the …” crunch, crunch. Then my line went dead. I didn’t even try to call him back. A missionary friend of mine calls this road the Wages of Sin Road, basing his observation on Romans 6:23: “The wages of sin are death, but the gift of God is eternal life through Jesus Christ.” This title actually works for me, though my team, who has ridden up and down this road or a portion of it numerous times in the last two weeks, now calls it simply the Roman Road in deference to the same verse. I’m sure the many Roman engineers, who built really fine roads in their time, are turning over in their graves at such abuse to their heritage by this comparison. I continue to collect unique and curious signage here in Uganda. The attempts to use English to express a marketing idea or business concept often produce curious results as the Lusoga to English translation stubbornly refuses to communicate the original intention. Sometimes you can tell what they were going for, and other times you have no idea what they might have been thinking when they came up with their final sign. Here are some of my favorites. A close second is a sign on a little shop by the side of the road on the way to Kiranga. It proclaimed in black hand-painted lettering: Jerusalem Pork Joints. I’m thinking someone maybe didn’t do their research there. I noticed an older man forlornly sitting in the doorway of this tiny wood shack by the side of the road today, hoping someone will buy his “joints” (ribs, maybe??). Way out in the villages, we have repeatedly passed through an intersection, and there right at the corner sits a small white building offering “saloon” services, which in Uganda does not mean what it means in the U.S. In Uganda this means salon, not saloon; as a result of this spelling quirk, there are saloons all over Uganda with a wide variety of beauty-related names. However, for some reason which escapes me completely, this little business enterprise in the village of Budongo (sp?) is proudly labelled Texas Saloon. Every time we pass it, I expect to see Ugandans in cowboy hats and six-guns. So far, I have been disappointed by seeing only Ugandans in hair-weaves and barber chairs. The other day we drove through a market in a little community on the outskirts of Jinja called Bujogali. In the middle of dozens of little shops lining the road is one that boasts a name with a strange mix of genres that leaves me wondering what the story behind that one is: the King of Life Vampire Blood Mobile Phone Service. Maybe I don’t really want to know. There is also the Empathy Kindergarten, the Saint Judith School (where Judith is the name of the Director’s daughter; the partner school in another community is named for the other daughter without the “Saint” in front of it – one wonders what the story is there), and the Kyabazinga School of Clinical Offices (where Kyabazinga refers to the deceased tribal king of the area). And then there’s always this one from the last trip where the sign is longer than the storefront that houses the school, the Kagoma International Tertiary Institute of Health, Sciences and Arts. I shared this during my last trip, I think, and simply repeat my former remark – big dream there, and I hope they’re achieving it!